The best run of holiday fun has begun! Halloween is this weekend (look for half price Halloween merchandise Saturday and Sunday, excluding books and costumes), stuffed (plush, that is) turkeys abound, and the Christmas and Hannukah books already have their own section in our picture books. Now is the perfect time to get out those wish lists and start matching the perfect toy to all the kids (and kid loving grown-ups) on your list. My first pair of presents is something I am eyeing for myself! 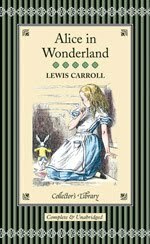 This tiny unabridged edition of two my favo rite books will add style to my Lewis Carroll collection: Alice's Adventures in Wonderland and Through the Looking Glass from Collector's Library, with original Tenniel illustrations. Once your Alice fan recovers from the gold-edged pages and perfectly replicated Tenniel drawings, let them open the Alice in Wonderland Mug from Unemployed Philosopher's Guild (best toy company name, hands down!). 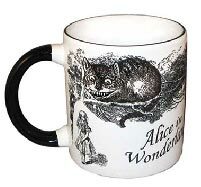 When you pour your hot beverage of choice into the mug, the Cheshire Cat disappears...leaving behind its grin! For the auto enthusiast (like my six year old nephew, still a vehicle fanatic), I'd recommend the Fast Wheels Art Set from Italian toy company Carioca. 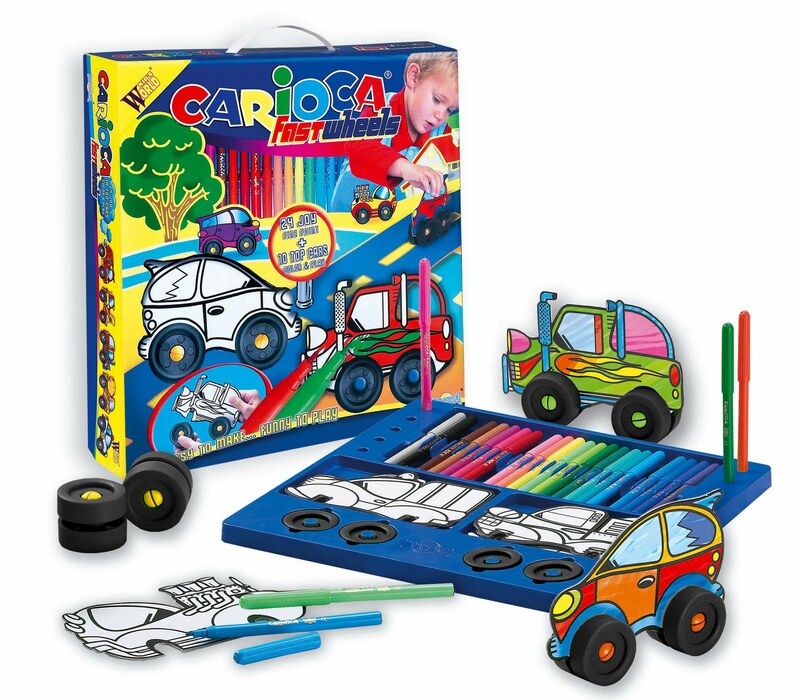 This activity kit comes with 20 fine tip markers and heavy cardboard cut-outs of cars to color, with sturdy wheels to attach for racing. Pair it with The Modern Storybook by Wallace Wadsworth, illustrated by Caroline Ruth Eger. 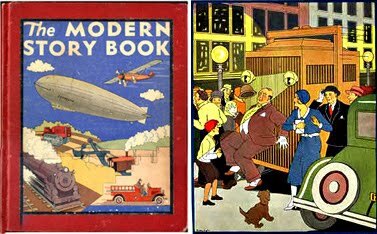 This Dover Publications reprint from 1931 is a collection of stories about personified vehicles, which comes with a CD recording of every story. My favorite is the "Runaway Elevator", in which an elevator and truck trade jobs for a day. 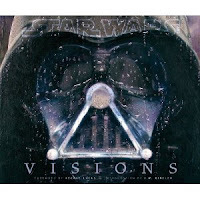 While I'm thinking of my own shopping list, which includes some serious Star Wars fans, we have plenty of new books and merchandise from George Lucas and co. My top pick is Star Wars Visions, as edited by Acme Achive, a coffee table style book full of various artists' interpretations of Star Wars characters and famous scenes. I wish I had a print of Kermit the Frog and Yoda by artist Peter de Seve. Pair this with Chronicle Book's Yoda figurine: the figure comes with a display stand, stickers, and a book of wisdom. 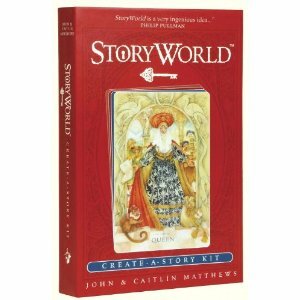 For the creative teen on your list, try Storyworld, a create-a-story-kit by John and Caitlin Matthews. These tarot-like cards have rich, intricate illustrations with prompt questions on the back, to inspire any kind of artist or writer. 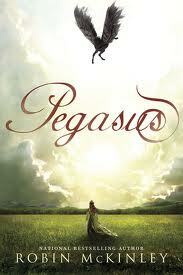 Pair it with Robin McKinley's newest novel, Pegasus, a atmospheric fantasy about a princess and the pegasus she is bonded to, or Patrick Ness's Monsters of Men, the concluding book in his dystopian Chaos Walking series. Halloween is coming up fast, and the hut is overflowing with ghosts, spiders, bats and rats in preparation for Sunday. Yes indeed, there is plenty of creepy, ghoulish fun going on around here, but what caught my eye recently wasn't any of our (completely awesome) Halloween toys. 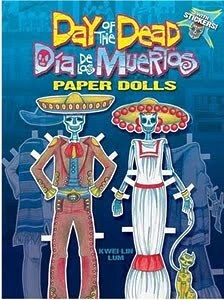 It was our new Day of the Dead/ Dia de los Muertos paper dolls from Dover. These skeleton dolls may look creepy at first blush, but in actuality the Mexican Day of the Dead isn't a spooky affair at all. Rather it's a day to honor departed loved ones and welcome them back to the realm of the living for the day, with music, picnics, and festivities. And these skull faced characters get dressed to the nines for the occasion! The traditional Day of the Dead Catrina and Catrin come with a ton of super-snazzy ensembles, including traditional Aztec garb, a zoot suit, Mariachi clothing, even wedding day duds. They're vibrantly colored and completely funky and whimsical, (and okay, a little spooky) and I can't look at them without picturing them hanging out on a bulletin board in my apartment, or maybe stuck with magnets to my refrigerator. Bonus points to the stylish Catrina for even having a cute kitty to accompany her during the festivities! October has been chock full of fun events so far! On October 9th, we had a visit from Julia Pimsleur Levine, the creator of the early language learning series, Little Pim. She showed a few sample DVD episodes and answered parents' questions about raising young children to be multilingual. 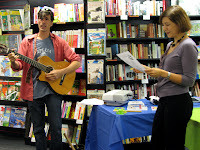 Rafael Medina, a local musician, performed songs in Spanish and English, and even got some singing help from the audience and Julia on songs from the Little Pim music CDs. Julia emphasized that young children - toddlers and preschoolers - are the most impressionable and fastest to pick up languages. As we get older, learning a language becomes significantly more difficult (as many of us may remember from high school French classes). In addition to further developing the brain, being multilingual in our globalized culture can present more social and economic opportunities. From the planning of the event through describing Little Pim's goals and answering parents' questions, I was impressed with Julia's passion: this is a woman who discovered there weren't many resources available to teach young children foreign languages, and so simply developed the resources for herself and other parents to do so. There are DVDs, music CDs, and flash cards available in French, Spanish, Chinese, among other languages. 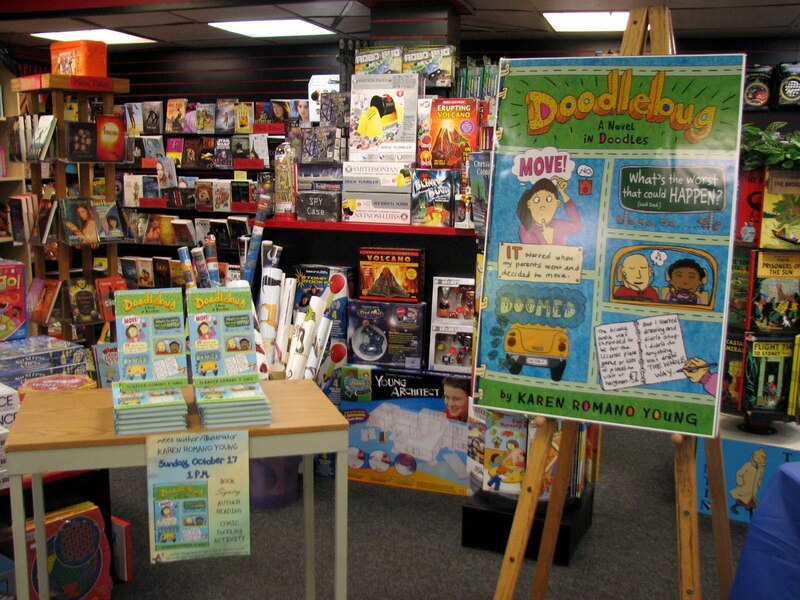 A few weeks later, author and illustrator Karen Romano Young read an excerpt from her new middle grade graphic novel, Doodlebug: A Novel in Doodles. Kids and adults alike made a beeline for the mural paper and crayons. We saw some pretty amazing doodles! 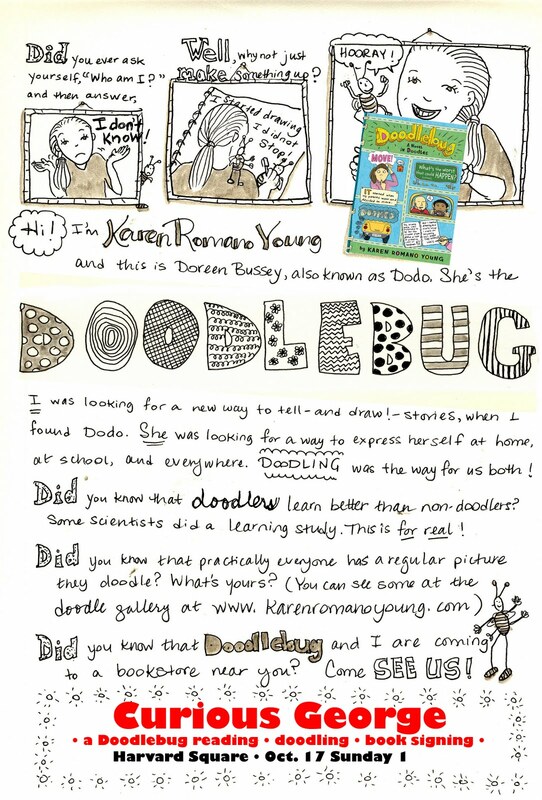 My favorite part of Doodlebug is how Dodo, or "Doodlebug," uses her drawing: it helps her focus in school, it sorts out her thoughts and feelings about moving, homework, and her family, and best of all, drawing helps her learning. I found the resolution of the story very satisfying; Dodo's teachers and parents acknowledge that there are many ways to learn, and some kids do need to translate information visually. The best example I thought was how Dodo taught her younger sister about decimals using diagrams of a song playing on a iPod. Karen and I had a great conversation after the event about how the growing market of graphic novels is wonderful for "reluctant readers" or kids with learning disabilities - not only do these books offer an alternative way to interpret a story, they're also fun. Our next author event will be on November 20th at noon: musician Gordon Titcomb will read from his new picture book, The Last Train. Bring your train whistles! You can also come by the store the Saturday before Halloween, the 30th, for some creepy crafts and scary snacks during story-time at noon. I am a person who believes we could all use a little more whimsy in our decor. Sure, sophisticated, grown-up interior design is nice, but where's the fun? Yes, the grown up in me loves when the window treatment is the perfect blue to match the throw pillows, but the kid in me loves something silly and unexpected thrown in for some flavor. Which is why I'm completely tickled by the Moon in my Room from Uncle Milton. 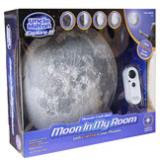 It offers a realistic three dimensional light up moonscape to mount on your wall, along with a remote control to manually move through 12 phases of the moon (or set it to automatic to just sit back and enjoy). It also comes with an audio CD full of interesting lunar factoids, so it's educational too. And if you're looking for some last minute Halloween party decor to keep your werewolf costumed buddies howling? This is just the thing. This kit looks small from the outside (a great gift, they'll never guess! a nice souvenir, it packs well!) but it is chock full of cinematic goodness. It starts with a book that explains the basics of filmmaking terminology, setting up shots and lighting, as well as tips from the pros on making a film. But from there the kit just gets more awesome. It comes with a working clapper-board/chalkboard, a fill-in storyboard, a CD of sound effects, props like push-out mustaches and tattoo stickers, and animation aids like a push-out studio set and characters. PLUS, everything you need for premier night from push-out tickets to a poster template. Get this for the next Maya Deren or Ingmar Bergman in your life! We've actually had this in before, but we sold them so fast I didn't get much chance to drool over them! But now they're back and I WANT TO PLAY! You pick a car, truck or thing that goes, and move along the board spying various Busytown characters and items to advance. The stickers alone in this mega-activity book are tempting. But add the many pages of glorious typographical coloring and games and this is an awesome, beautiful and crafty boredom buster. It's that time of year, when we start hunkering down with piles and piles of books (err, more so than usual), and start the Big Debate(s) of Kids Books Land: the awards announcements! The National Book Foundation has announced its finalists for the 2010 National Book Awards. The young readers choices are as follows: Ship Breaker by Paolo Bacigalupi, One Crazy Summer by Rita Williams-Garcia, Lockdown by Walter Dean Myers, Dark Water by Laura McNeal, and Mockingbird by Kathyrn Erskine. I've heard some great reviews of these books, so I'm going to have to bump all these nominees to the top of my reading pile. I haven't felt as strongly about any 2010 books for NBA or Newbery Medals as I did for When You Reach Me last year, so I must expand my reading in the next few months! The Caldecott Medal is another story: I'm rooting for the gorgeous debut A Sick Day for Amos McGee by Philip and Erin Stead, with honors to David Wiesner's Art and Max and Beaver Is Lost by Elisha Cooper. My book club hasn't had its Mock Caldecott meeting yet, so we'll see if anyone convinces me to change my tune. The debate about picture book continues on, and Curious George had a chance to contribute the the discussion! Yesterday, Karen Lotz, Publisher of Candlewick Press and Betsy Groban the VP and Publisher of the children's department of Houghton Mifflin Harcourt, and I had a discussion about the article and how we see picture books on The Emily Rooney Show on WGBH: The End of Picture Books?. I was in awe being alongside such incredibly smart, experienced and well-spoken women. I love that my job puts me in the path of talking to some of the big cheeses in the business - and we're all in agreement that kids books and kids themselves deserve more credit and attention. It was my first time on air (those headphones were too big for my head! ), so please forgive my little camera shy moments. Before the fame could go to my head, I came back to the store and supervised a new staffer assembling a Melissa & Doug Deluxe Pirate Ship. All in a day's work at ye old Curious George shop. Thanks to the kindly folks at WGBH who thought of us at Curious George and made us feel very welcome. It's pretty funny how such a negative article has given picture books so much attention: if not for this article, would so many people be talking about these books and young children's reading? I'm not complaining there. Our book buyer, Donna, found this illustration in the October 10th New York Times...and put it on the back of our employee door. I still feel the way that last kid looks, when trying to read Finnegan's Wake. It's a reading frenzy here in the chapter book room, with staff members sneaking new books off the displays and devouring them (metaphorically, for the most part) on their lunch breaks. Here are our latest staff choices for you. This book weaves the stories of three really interesting characters in a subtle and interesting way. I really liked that the book showed all these characters without judgment, and in the end it seems to say that no matter who you are--whether you’re driven toward a goal or an aimless wanderer--what matters is that you're okay with yourself. 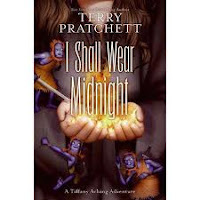 This 4th book in the hilarious Tiffany Aching series concludes the adventures of witch Tiffany and the rambunctious, kilt-sporting Wee Free Men. As always with Pratchett, there are many laughs, puns, and subtle satirical scenes. I'm sad that a favorite series is over, but Tiffany's coming-of-age is as wonderfully unsentimental as it is heroic and humorous. Plus, I can always reread them! The Wee Free Men books are perfect for grads of Diana Wynne Jones's Howl's Moving Castle. 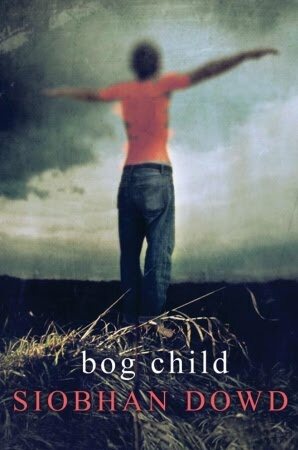 When Fergus finds the body of a child preserved in the bog near his Northern Island home, he is drawn into an ancient mystery that occupies his dreams. But Fergus has problems here and now: his brother is on hunger strike, and the political turmoil that surrounds him is threatening to divide his home. 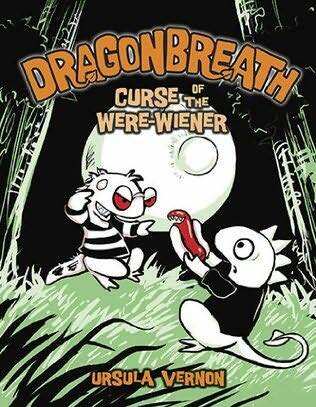 Reluctant readers will love this series; somewhere between graphic novels and heavily illustrated chapter books. You'll want to be best friends and sidekicks with mythical dragon Danny who hates homework and dreams of being a pirate while stuck at a school full of normal amphibians. 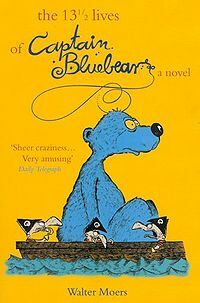 All the inhabitants of Atlantis crowded together to hear the (only slightly embellished) autobiography of Bluebear; the hobgoblins could not console themselves without his nightly performances, and the thoughts in the Bollogg's brain paid generously to witness his dreams - who are you to resist reading his story? After prank-calling a lonely old man named Angelo Pignati, two teenagers inadvertently begin an intense relationship with him that ultimately leads to his death. As John and Lorraine take turns telling their sides of the story, they begin to deal with their feelings of guilt and loss. Similar to S.E. Hinton. The Penderwicks can stand alongside the great tradition of family stories, like Edward Eager's Half Magic, Frank Gilbreth Jr and Ernestine Gilbreth Carey's Cheaper by the Dozen, and Elizabeth Enright's Melendy Quartet. These four sisters (responsible Rosalind, practical Skye, imaginative Jane, and butterfly-wing-wearing Batty) along with Hound Penderwick are about to have their best summer vacation yet - full of escapes, scrapes, a mysterious boy next door, and pet rabbits! 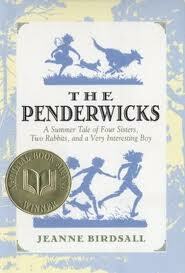 Also look for the sequel, Penderwicks on Gardam Street. A gorgeously written story about a New Orleans girl with a special power, fighting to survive Hurricane Katrina and its aftermath. Readers who live for interesting characters will love the relationship between Lanesha and her Mama Ya-Ya, and fantasy fans will love the hint of magic behind the gritty story. 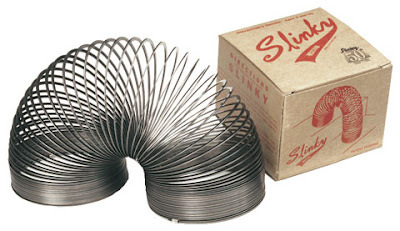 A question: Who among us hasn't experienced hours upon hours of childhood fun with the deceptively simple slinky? Exactly. So please imagine my glee when I came back to the Hut after the weekend and discovered a brand new stack of slinkies just waiting to be played with! And not the re-vamped, brightly colored plastic slinky. Oh no my friends. This is the classic, collector's edition metal slinky. The metal slinky is superior for a myriad of reasons: The weight feels better in the hand, and also helps considerably with the "walking down stairs" trick. The sound is more satisfying, and in my experience the metal slinky is far less likely to become twisted than it's plastic counterpart. Plus I believe the classic slinky gets bonus points for sheer nostalgia. In all, a perfect toy for keeping on your desk to keep your hands occupied while your brain works, or maybe even send on a trip down the stairs once in a while, just for fun. An article in the New York Times yesterday, Picture Books No Longer a Staple for Children, certainly has people talking. There's a great comment thread and we in the hut have been mulling it over. Essentially, it says that picture books are fading out of children's reading experiences for a few reasons: the struggling economy, a focus on teens, and primarily, the push of overly enthusiastic parents. With regard to the economic downturn, I do see that publishers are putting out smaller lists. At all ends of the publishing industry, and I'm sure many other industries, people have to cut corners. But I'd hope that this means that the selection of manuscripts is stricter, and the best, most exactingly edited books are published. (This is assuming, of course, that publishing house staff hasn't also been exceedingly culled). With fewer mediocre books, and more focus spent on each individual book, perhaps the exceptional picture book will be more likely to find its way to its readers. But, really, no matter the details of how many and how well and how much, I believe there are still a significant number of people that want picture books. It is my daily experience, at least at this particular store with the majority of our shoppers looking for baby to preschooler items, that people like picture books. Basically: fewer books on the market doesn't necessarily translate to less sales; if people want to buy a picture book, they will buy a picture book. In some stores I could see that YA book sales are expanding, and therefore may physically expand into other departments. As my former colleague (now a children's book editor) reminds us, this doesn't always mean that teens are buying more teen books. 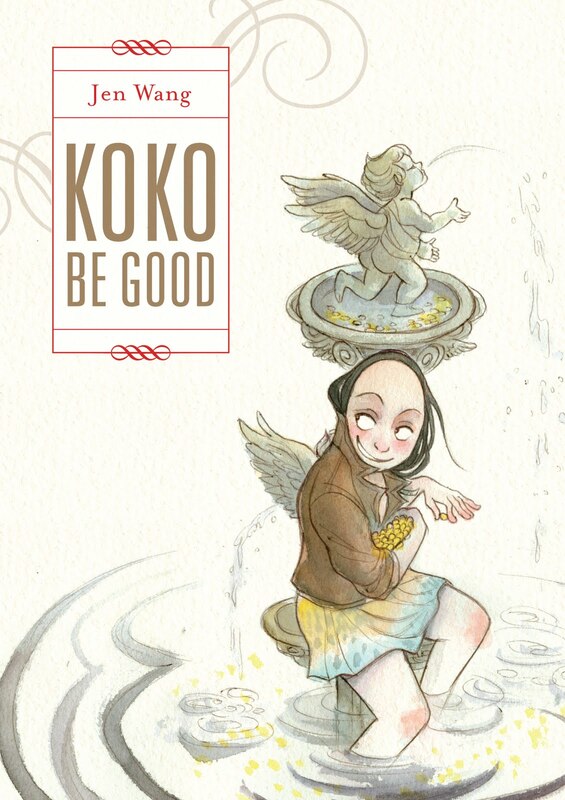 The adult crossover appeal is such a phenomenon that there are blogs devoted to crossover recommendations and panels about it at places like BookExpo America. Teen supernatural romance and dystopian fiction is a literary and commercial trend at the moment - the way all industries have trends - and I'm going to simply be happy that we can talk about such a thing as a cross-generational trend in the media. (We can talk another day about what difference, if any, the intended audience versus additional audience of a book makes on its writing, its sales angles, its cover artwork...to say nothing of what it means to live in a culture in which an utterly different consumer bracket is consuming a supposedly targeted product). At Curious George, we have a whole range of middle grade and teen fiction, but our driving sales come from picture books and baby books. To me, that says more about our neighborhood and how people see than it does about the overarching state of teen versus young children's literature. Which brings me, finally, to what I am most conflicted about here: the shoppers, the parents, the people who buying or supposedly not buying picture books. From my own experience working in Harvard Square's children's bookstore for three years, I have met many, many kinds of shoppers. There are occasionally the folks who would rather purchase toys because "kids can't read yet anyway," but they're still looking for something the kid will like, as they see; for the most part, the massive majority of folks in our store want good, age- and ability-appropriate books for the kids in their lives. I feel quite uncomfortable with the portrayal of some enthusiastic parents in this article; whether or not I agree with their views, I don't think it's entirely fair to hint that these parents are pushy, making their kids read books they don't want to (or possibly, are not ready to) read. [Edit: On her own blog, the mother in the article feels she was quoted out of context]. There certainly is a trend now for starting kids talking and reading early, for instance, Brainquest, the company that makes flashcards and workbooks that are used in schools and homes, now makes wipe-clean alphabet or counting flashcards for ages 2+. I may not agree with the practice of discouraging picture books in favor of more "mature" reading (if these parents even do that), but I cannot fault parents for wanting the best for their children and being involved in their education. Of course, I do admit that my own preference is a family in which the children are free to roam about the bookstore or library and read what they are drawn to, with occasional subtle direction from a parent/sibling/librarian/teacher. Sometimes a kid is a reluctant reader because he hasn't found a book he really likes yet; sometimes she's just not much of a reader, period. I'm OK with either scenario, as long as the opportunity and encouragement to read and learn, by all manner of sources, is there. I don't agree with a parenting style that focuses more on the future "results" than on the child's current happiness and abilities, but I also disagree with vilifying parents for taking an active interest in their child's development and opportunities. Thankfully, there are some qualifications to the "picture book on the wane" argument in the article. After a quote from Candlewick's publisher Karen Lotz defending the complexities of picture books, we are told that "Many parents overlook the fact that chapter books, even though they have more text, full paragraphs and fewer pictures, are not necessarily more complex." While beginning readers and chapter books are intended for children to read on their own and thus may stay generally in the verbal and emotional vocabulary of the reader, picture books are intended to be interpreted by adults to children and so can also carry some hefty topics, so to speak. Look to Kevin Henkes mice books, Robie Harris's body books, or anything by Todd Parr: these are by no means simple or empty of emotion. Picture books are an activity, a communication, a relationship between parent and child, reader and audience. Picture books are useful: they help children learn visual and mental focus, the early building blocks of language, tonal emotion, all while creating a bond between reader and child, and a bond between books and the child. On top of all this, picture books are simply beautiful. If this article's statement that picture books are being phase out is anywhere close to being true, then I hope to the stars that this article makes people notice that, and makes people want to do something about it. We actually had a customer come in yesterday and ask for a giant stack of picture books because of the article. While plenty of us involved in publishing, education, or however else invested in children's literature, may disagree with the article's assumptions and ignorance or the kind of "get ahead of the game" parenting it describes as common, I take some comfort in the fact that here in this prestigious newspaper is an article about picture books and children's literacy. An article that interviews independent bookstores as well as large and small publishing houses. An article that at the very least books with pictures, books for young people, as something worth reporting - even if we disagree with what it says about those books. Here is an article that has over 300 comments on its website by the next day. However we feel about the importance of picture books versus chapter books in children's verbal and emotional growth, I will take some comfort and pride from the fact that we are discussing them. Last week we hutters switched over the last of our going-to-school display to Halloween. I was barely coping with it being fall (and needing rain boots! ), and it's time for face paint, guides to cutting a unique jack-0-lantern, bean bag gourds, and ghost stories! At least the new merchandise and books are supremely adorable. Here are some of my favorites. I really know it's getting along in the year when we start decorating the Melissa & Doug giant plush with cozy clothing. (Hey, I know you love my construction worker giraffe ensemble in our Brattle window.) Two's Company Animal Knit Scarves are the perfect accessory for the lovable penguin, panda, or preschooler in your life. Gund is known for its cuddly plush, and every fall I look forward to its new autumnal plush. This year, they have wee Harvest Beanbags, in the shape of smiling gourds and acorns. My mother loves making little holiday displays, so her fall care package is definitely going to have some of these critters. 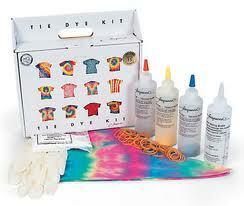 For those days it 's really too blustery to stay outside but you need something to do, try the Tie Dye Kit by Jacquard. This set includes three dyes plus an empty color mixing bottle, enough to make ten to fifteen t-shirts. It also has rubber bands, gloves, and a DVD with ideas for folding techniques and different items you can dye. You may want to try this kind of activity in your garage or with newspapers covering the table, but the minor mess potential just makes it that much more fun! When it co mes to books, there are so many gorgeous new titles and brilliant new issues. A favorite standby of mine is a board book edition of Leaves by David Ezra Stein, about a baby bear's first encounter with falling leaves: "'Are you okay?' he wondered." Stein's pen and watercolor illustrations and spare text make for a winsome, whimsical tale. Another modern classic I love is Mouse's First Halloween by Lauren Thompson and illus trator Buket Erdogan. This endearing title in the Mouse series is Mouse's adventure on Halloween evening, where he discovers that some mysterious bumps and rustles (tumbling leaves, apples dropping from trees) in the dark are "not so scary after all." 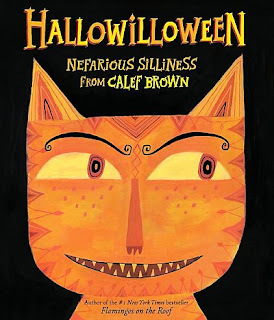 This picture book is perfect for the timid trick-or-treater. 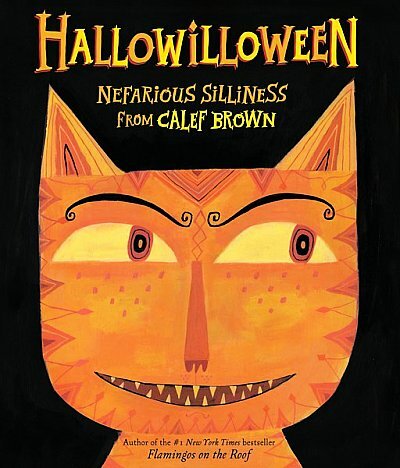 One new title we'r e really excited about is Hallowilloween: Nefarious Silliness, a book of poems from Calef Brown. One staffer, a solid Brown fan, was cackling in the hut, reading these poems aloud to us all. Her favorite is "The Portrait of Gory Rene," about a man whose hideous portrait strangely becomes more and more handsome, until he has to hide it in the attic. (Hmm...remind you of someone?). In the chapter book room, our book buyer extraordinaire is very happy that it's time again to put out the beginning chapter book Squirrel's World by Lisa Moser. Squirrel is very helpful and a very good friend: when he almost forgets to say good night to Mouse one evening, he dashes back out to Mouse's tree stump and wakes him up to tell him good night. 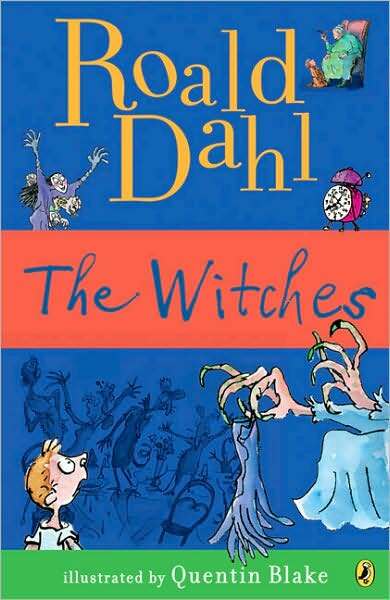 Who cou ld get through Halloween without the modern classic The Witches, by Roald Dahl? I reread this comic horror chapter book every autumn to get a head start on the creepy chills...and a refresher on how to discover a child-loathing witch. 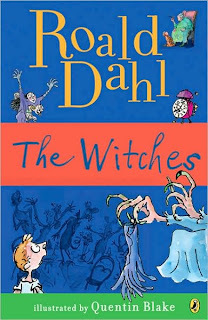 Roald Dahl has books for grown-ups too: Skin and Other Stories as well as The Umbrella Man and Other Stories are perfect for those blustery nights when the wind howls between your apartment buildings (you hear me, Cantabrigians). 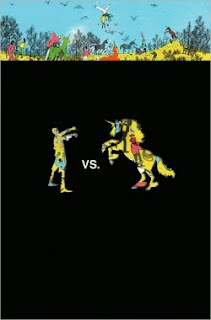 In ne w books, our staffer Shara raves about a new fantasy collection Zombies Vs. Unicorns, edited by Holly Black and Justine Larbalestier. This collection features such fantasy greats as Garth Nix and Cassandra Clare (meanwhile, are you reading Clockwork Angel, the first book of Infernal Devices?) with Margo Lanagan and Diane Peterfreund (also with a new killer unicorn book out, Ascendant). Some say the world will end in zombies, some say in unicorns...which do you choose? This creative, quirky picture book might just make it into my top 20 books of all time - any age of fiction included. I love the orange monochromatic color scheme, go weak in the knees over the illustrations, and if I ever recover my wits enough to comprehend the plot, I vow to take it as an example for my every action. 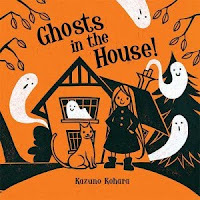 Instead of succumbing to the normal reaction of seeing several ghosts in one's home, the little witch in Kazuno Kohara's story decides to re-envision the problem. The ghosts look scary and rather unhappy at first, but they also remind everyone, including the little girl, of fabric. And what does one do with dirty, unhappy clothes? Pop them in the washing machine, of course. Thus the surly ghosts become cheery, smiling curtains, a table cloth and two bedspreads. A unique solution to an age-old problem. this would also be a fantastic book for children who are scared of ghosts, for the little witch shows the perfect way to deal with one. I readily admit that The Graveyard Book would be excellent enjoyed at any time of year, but reading it during the Halloween season is akin to enjoying a hot cup of tea on a cold winter's day, that is to say, it fits just perfectly. Without ever mentioning the holiday specifically, it entices the imagination to dwell upon benign ghosts, ghouls, witches, and, of course, a wise and almost friendly vampire. What sets this book apart from many other holiday novels is the quality of story telling. 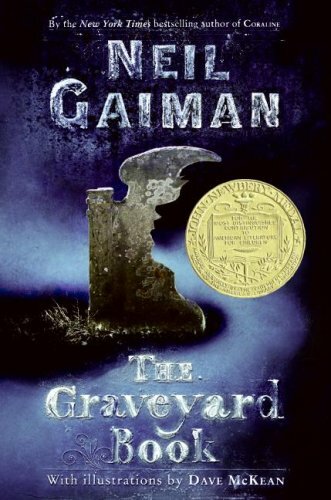 Neil Gaiman shows the reader the life of the main character, Bod, in a sequence of short, well crafted stories. By the time he has to face the society that murdered his parents - he is ready, and the reader knows exactly why. This is a must-read for fans of J.K Rowling, Nancy Farmer, or Rick Riordan. This sweet board book is a fantastic introduction to the fall, and Halloween, season for younger readers. 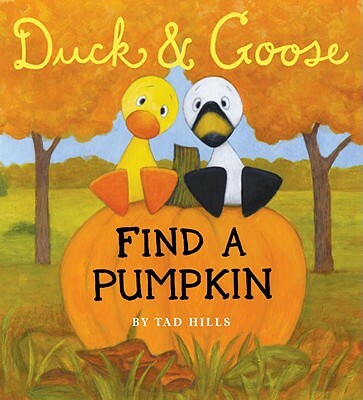 Toddlers will love watching cute duck and goose interact and enjoy trying to point them in the right direction. This board book is particularly nice in that it doesn't focus on the more frightening aspects of the holiday, it instead leads readers to look at the step even before carving a jac-o'-lantern: finding a pumpkin. This product is a much more sophisticated take on the old practice of simply coloring a cheap pillow case with markers. Coloring in the haunted house and ghosts could be a great pre-Trick-or-Treat activity; one I would have loved to indulge in as a kid. I don't know about you guys, but I'm not much of a watch girl. Cellphone? Sure. iPod? Why not. But as far as timepieces are concerned, I just never felt a tremendous need for the old fashioned watch. 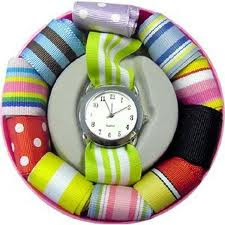 Until, that is, I discovered the completely adorable Quick change watch from Cartwheels and Cupcakes. It makes a great gift for the 8-12 year old girl set (it even comes in a cute-as-pie pink gift case that makes wrapping paper totally unnecessary), but I think it makes a wonderful gift for grown ups in search of a time piece with a little pizazz. The watch comes with eleven grosgrain ribbons that you can switch out to match your outfit or your mood. I'm particularly fond of the red ribbon with white polka dots--Like something Minnie Mouse would wear! And the ribbons themselves remind me of preppy canvas belts we were all rocking back in the '90s. Very retro. Join us Sunday, October 17th at 1pm for an excerpt reading, book signing, and drawing activity. How do you doodle? 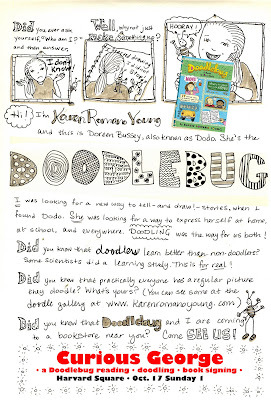 Doodlebug is a middle grade graphic novel. If your junior high kid likes to draw, or better yet, simply wants to learn to draw, this event is perfect for her/him! 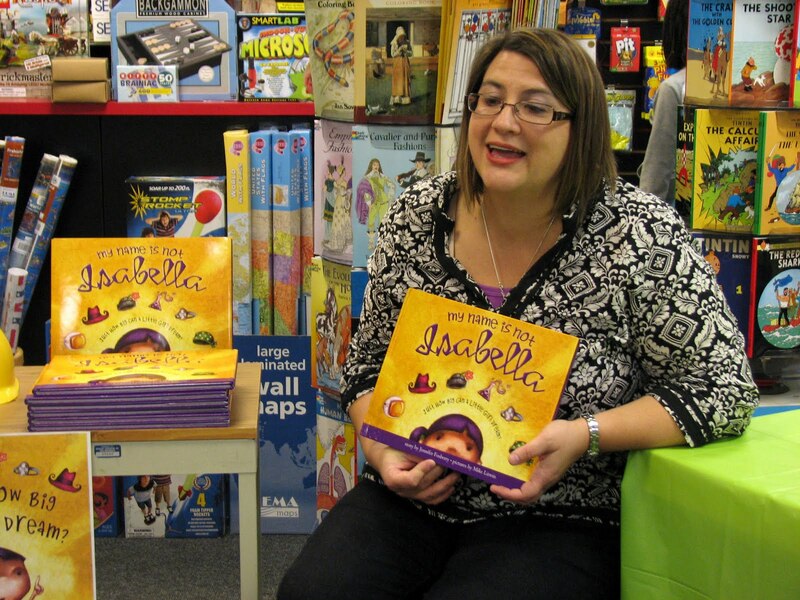 Our event with Jennifer Fosberry for her first picture book My Name Is Not Isabella went fabulously! 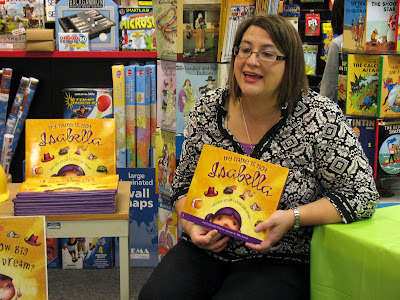 We had multiple rounds of a few groups of families who each heard an impassioned reading (Fosberry stamps her feet and shakes her head at Isabella's every repetition of "My name is not Isabella!") and had great discussions about why Fosberry wrote this book. She has a daughter who loved to play pretend as a princess, and she wanted her daughter to have a book with more imaginative possibilities; as Fosberry says, "a life beyond the tiara." Not only preschoolers will like this picture book: elementary schoolers through adults will, too: it's empowering and funny. I am so happy that there's a book like this out there now. 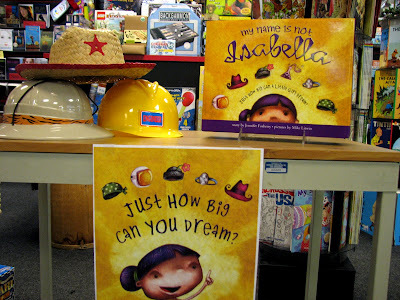 Girls and boys (and men and women) need books like Isabella to remind them just how big they can dream. We still have some Dream Big! cards in the store, so when you come by to check out the book, be sure to share your dream and we can post it here on the blog. In March, you can look for My Name Is Not Alexander, a corresponding book starring a young boy who also has a big imagination. Thanks so much to Jennifer for coming out here! She's going to be an author to look out for. 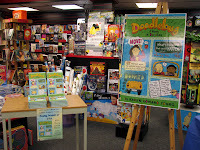 Thanks to everyone (especially Heidi and Kay) at Sourcebooks for their enthusiasm and help with planning this event. Because of all of you, and our great customers, we've completely sold out of the books! We'll be reordering and hope to have the author swing by to sign stock before she heads back to California.